How many of you start your day with a cup of coffee? Ok, now, how many different coffee makers do you have? If you love your coffee, like me, you probably have three to four different coffee machines in your kitchen. And for good reason. Just the other day, I noticed the glass on my Bodum Cafetiere was cracked. Seriously? Yep. The Bodem carafe was cracked from top to bottom. Massive bummer! It was really annoying, because I was looking forward to my morning French press coffee ritual. It probably cracked in the drying rack with other dishes. Mind you, I always hand wash it, and probably put other things near it or on top of it. I’ve had that Bodum 4 cup coffee maker for nearly 10 years! So what did I do? This post contains affiliate links. If you click on something and make a purchase we may make a small commission at no extra charge to you. For more information, please see our Disclosure Statement about all our affiliations. Can you see the crack on my poor Bodum carafe? Top to bottom. Bummer! Luckily, I had a backup plan. I also have a Bialetti 6 cup coffee maker close by, as well as a quick Nespresso-style coffee machine, so I made a fresh pot from my Bialetti coffee machine.. Morning saved!!! Did you know that the Original Bialetti Moka Express maker has been around for more than 80 years. I truly expect this one to last that long as well. To be honest, I use the Nespresso-style coffee maker infrequently. I use it mainly if I have guests that stop by or I need a quick cup and don’t want to make a full brew. Ta da…. My Bialetti Coffee maker came to the rescue. Any rate, I now have the conundrum of which coffee machine to buy. I definitely want a new French Press coffee maker, but I’m not sure if I want to go back to the original large French press Bodem coffee maker or another top rated small French Press coffee maker. I work from home, which means I consume a lot of coffee. 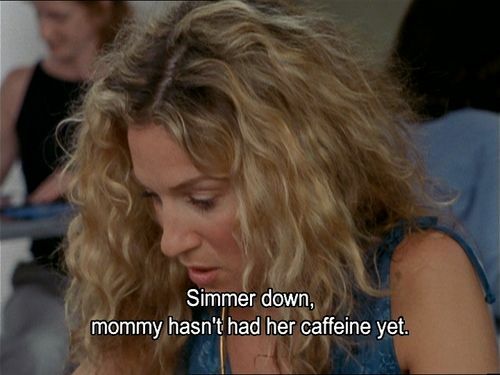 And I really want the best coffee maker for the money. But I also don’t want to make a ton of coffee that gets cold quickly. So I decided to put together the best small French Press coffee maker reviews. Hopefully this will help you decide what coffee machine to buy, especially if you are looking for the best small coffee maker. 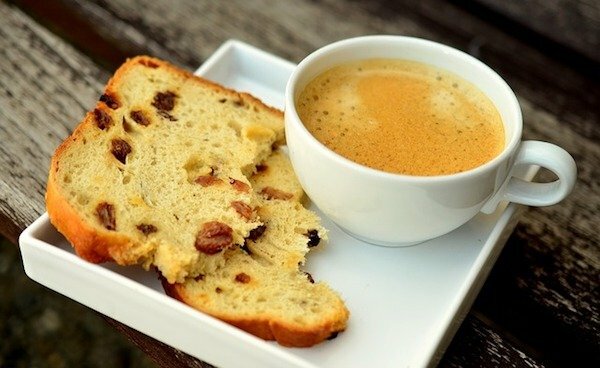 My favorite coffee, for some time now, is one I make from my French Press coffee maker. I usually brew a large French Press pot in the morning, and sip it until it is freezing cold and bitter. Not tasty. 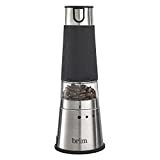 Now, since my Bodum carafe is broken, I think it’s time to change tactics and look more closely at the small French press coffee maker options. .
2 Why Buy a Small French Press Coffee Machine? 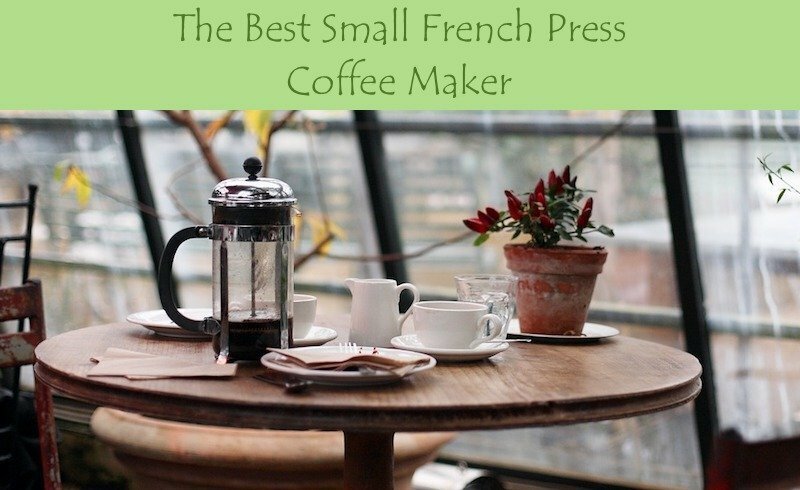 3 The different styles of small French Press coffee makers? 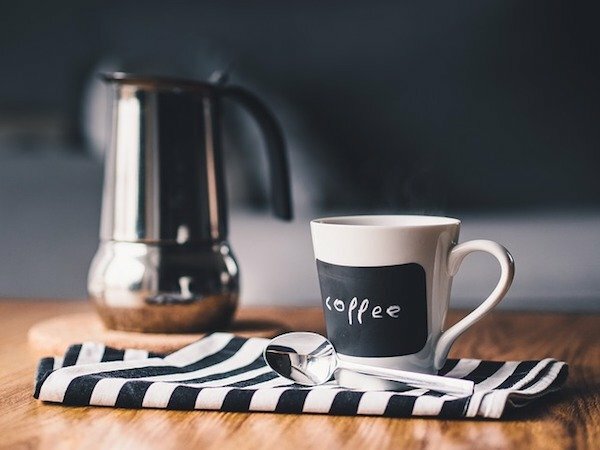 6 Why are people so enamored with French Press coffee makers? The ceremony of making coffee, and enjoying it, should be appreciated. It shouldn’t be where you make a huge pot and let it go cold, or worse, let it become bitter because the coffee grounds have been swimming in the pot for HOURS. It defeats the purpose and it’s not great on the stomach. I remember the old days when my parents would make a pot in the old drip Mr. Coffee maker and then let it bake on that plate for hours. Yuck! I’ve now come to the conclusion that the best coffee comes from small French Coffee Presses. The same concept as the large French press, but they brew enough coffee for 1-3 cups. Why Buy a Small French Press Coffee Machine? The small French Press coffee makers are a perfect start in the morning, and equally suited when I have friends pop by for a quick coffee break in the afternoon. With the small press, your coffee is hot, fresh, you use less grounds and the small French press makers take up less space. Another thing is that I sit for long periods of time at my computer, which is a no-no. Since I love coffee, this will force me to get up and take a break for 15 minutes to prepare another small plunger pot of coffee. 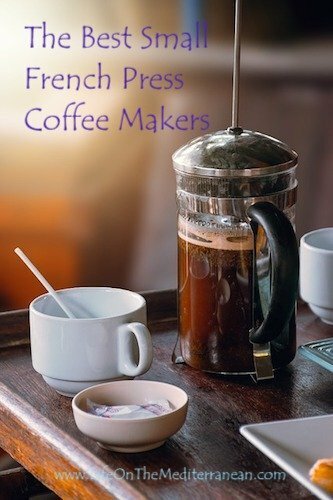 The different styles of small French Press coffee makers? Primarily there are three types of small French Press coffee machines: glass, stainless steel and ceramic French Press coffee makers. Glass French Presses: The glass carafes are standard, but are more fragile to heat and to washing up. Make sure the glass is heat resistant and made of borosilicate glass. The carafes are usually encased in a metal or plastic frame, and/or have bumpers on the bottom or a ‘rest’ you can place them on. You can also keep an eye on the coffee grounds as you are brewing. Stainless Steel French Presses: Clearly this is much more durable, and the best small stainless steel coffee machine comes double-walled. This keeps the coffee warm for longer. But at the end of the day if you are using a small French press, you’re only making enough for a couple of cups, which should be consumed rather quickly. 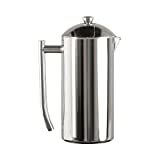 I think a Stainless Steel coffee maker is best in larger French Press machines. Any rate, ensure the quality of the stainless steel is 18/8 or 18/10. 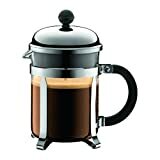 Ceramic French Press Coffee Maker: French stoneware or ceramic French presses offer a durable press. They are long lasting. This style of insulated French press coffee maker is one of the best coffee plungers, and they are a stylish countertop coffee machine. The Coffee Plunger: This is what you used to press the coffee down into the carafe once you’ve poured in the coffee and hot water. The plunger comes with a screen (two screens are even better) on the bottom that separates the grounds from the coffee. This plunger should be straight and sturdy and the filter should be tight or level, not wobbly or the grounds will escape when you plunge! The Coffee Lid: Many French press coffee lids also have a second screen at the pour section of the lid. This will catch coffee grains that bypassed the first screen. At the end of the day, you don’t want ‘mud’ in the bottom of your cup. That happens a lot, so the best coffee to use in your small French press are those with a bigger grain. 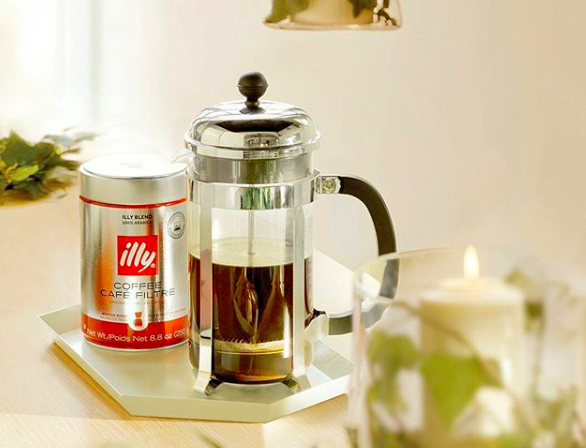 And personally I find the best coffee brand for french press is Illy. They are Italian and they’ve been in business a long time and know the process of brewing French press coffee. Check the reviews of each small French press coffee maker below. Let’s dig in with a bit of history… Ok. Arguments may ensue here, but the first French Press Coffee Maker was patented by the Italians and not the French… ‘Oh, mon Dieu’! Don’t shoot me. I’m just the messenger. Yep. 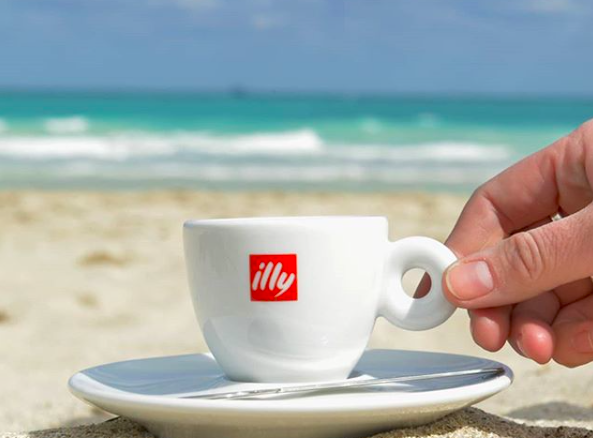 The Italians love their espresso and have a long history with coffee. And it was originally a Frenchman who used a fine screen on his coffee pot to filter out the grounds. But, it appears he didn’t do anything with that idea. 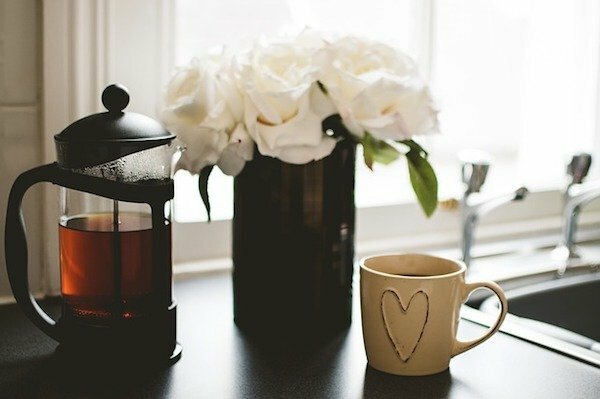 Why are people so enamored with French Press coffee makers? There are a number of reasons, but mainly because these press coffee makers allow you to control the type of coffee you brew. You pour in the best coffee for your french press and add the right amount of water. Give it a stir, wait a few minutes, press down on the coffee plunger, and you have a perfect cup of coffee. It’s quite like tea that steeps for a certain amount of time. Coffee is equally as delicate. If you think of the standard American drip coffee maker, the grinds go in the filter and the water trickles down on top until it comes out the other end. Sounds kind of gross, actually. The heavy, strong flavored coffee drips first and then the weaker brew drips out later. You can’t stir the coffee in the paper or metal filter, and the filters absorb a lot of the oils from the coffee beans, which gives it that robust flavor. Also, water temperature is more consistent in a French Press coffee plunger. The coffee steeps all together. Heat your water until just below the boiling point – around 200F or 94C, and pour the water over the grounds. 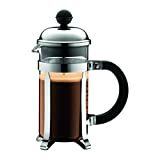 Give the coffee mixture a good stir and place the lid on the French Press with the plunger up – but don’t press it yet! Wait 4 minutes and then press down on the coffee plunger slowly until it’s all the way down. Then your coffee is ready. As always, the best coffee for French Press makers is coarse ground, and buy the best quality French press coffee you can find. 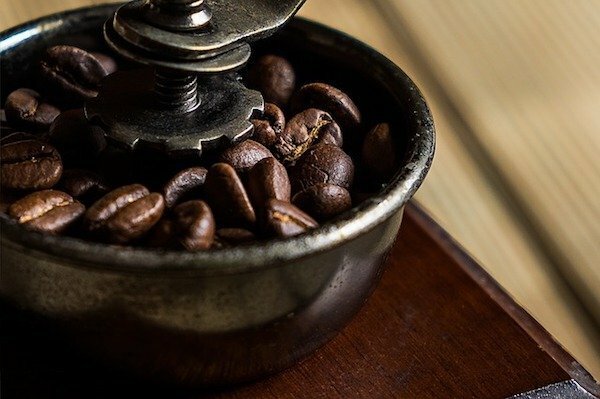 If you love your coffee like me, you’ll probably want to grind your coffee beans at home to the proper size, and I’ve mentioned a few coffee grinders below. 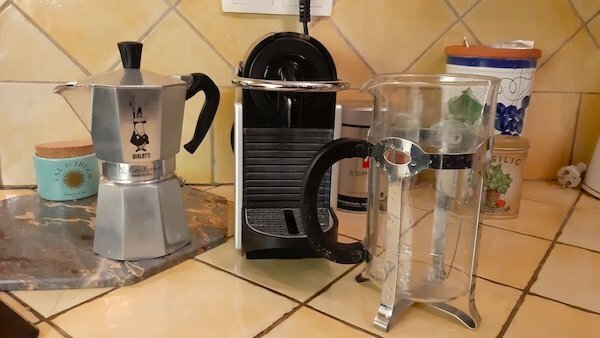 French Press coffee machines make fresher coffee: The small French Press coffee makers are quite easy to use, and make a better tasting coffee than a drip coffee maker, in my opinion. It’s made quick, you drink it quick, and the flavors are robust. Coffee can get cold in a big French coffee machine: Unlike a drip machine, there is no warming plate under a French Press, which is why you should drink most of it relatively soon after making it. That’s also why I’ve suggested a few Stainless Steel and Ceramic coffee maker options below. However, if you are getting a small French Press, the point is that you are only making up to 3 cups, so you’ll consume them before they get cold. You need to warm your French press carafe first, whether glass, stainless steel or ceramic with warm water. That helps the coffee stays hotter for longer. Otherwise, your coffee will get cold quicker. The best coffee maker for maintaining heat will be stoneware coffee presses and stainless double walled french coffee makers. Coffee oil: In a drip machine, the paper filter will absorb some of the oils in the beans. In a French press, the oils will remain along with the grounds in the bottom of the coffee pot. Glass carafes being glass have a tendency to break Duh. This is why I’ve included the best stainless steel and ceramic carafes, because they will not break as easily as glass and also keep your coffee warmer for longer. Any glass carafe you buy should be heat-resistant borosilicate glass. 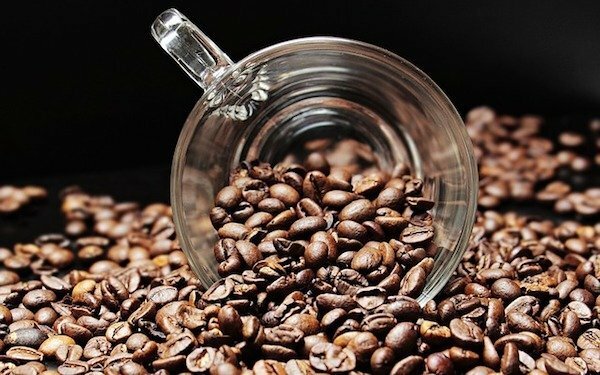 The really cheap French press coffee makers may be made of a different type of glass and you won’t have a working coffee maker for long. You get to watch your glass coffee press in action. In a glass carafe French Press you can watch the press in action. In stainless steel or French stoneware ceramic pot you cannot. But there’s nothing like watching your coffee plunge down the barrel, which is the appeal of the glass carafes. Coffee grounds in your coffee. The mesh can be a con. Get a small French press with a double mesh filter, if possible. I’ve had single mesh and over time they allow grounds to come through. The best coffee for French press makers is a bigger grind and if you get the right grind, you can better control or eliminate the sediment in your cup. It can be a pain but start with the best coffee for your French press and test it out. Otherwise, get one that has a fine mesh strainer at the spout to collect any floating grounds. Plastic parts in your coffee maker. Any plastic parts should be BPA-free plastic. BPA stands for bisphenol A, and it’s a nasty epoxy resin used in many plastics, which have health risks. You don’t want these elements seeping onto whatever you eat or drink, and many French Press lids, for example, are plastic, but they are BPA free. If not, don’t buy them. The Chambord Small French Press Coffee Maker is thee original French Press coffee maker that’s been around since the 50’s! And unless you are incredibly clumsy, this is a great starter French Press or one to reduce down to. It’s also great glass tea press. Super coffee plunger and super glass tea maker. It comes with a glass carafe that is made of heat-resistant borosilicate glass and BPA-free interior lid. It rests inside a sturdy metal frame and comes in numerous sizes. The handle is Polypropylene and generally durable. You can put this in the dishwasher, but I suggest you hand wash. I’ve seen a few comments about the handle coming loose, because it’s not attached with screws. I wonder whether the heat of the dishwasher may weaken the plastic handle. Any rate, beware. You’ll get 2 decent cups with the 17 oz maker, and has a 3-part stainless steel plunger with only 1 filter mesh. You may notice coffee grounds coming through the filter with age. Any rate, this is one of the best small coffee machines on the market. This award-winning, top-rated, durable Frieling French press coffee maker is only 9 inches high, and double-walled for 4 times the warmth capacity of glass French press coffee makers. This is brushed 18/10 Stainless Steel, and super easy to clean. It has a 2-stage filter system with a pre-filter and super-fine filter so you don’t get mud in your cup. Nice! The metal wire coil inside presses the plunger firmly against inside wall so fewer grounds get through. It’s dishwasher safe and I see these often in hotels! It’s tasteful, elegant and you can’t go wrong. 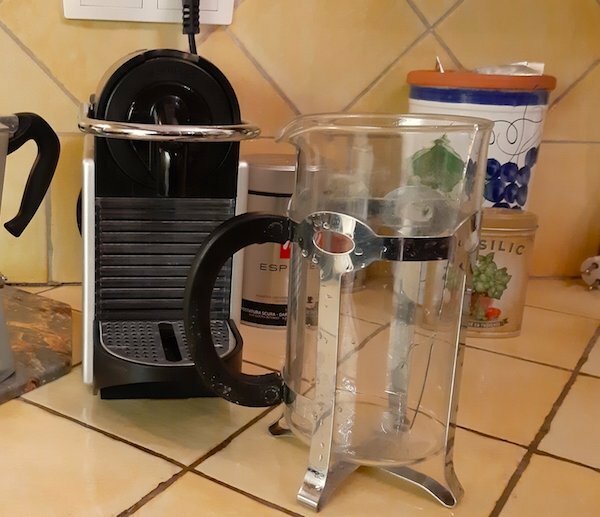 This has the exact same attributes as the brushed small Frieling French Press Coffee Maker above, except that it’s in smooth stainless and this one is a larger machine. This beautiful, mirrored stainless steel coffee press comes in different sizes, but the question is whether you have hard water? In France, we have hard water issues, and the exterior of this can accumulate lots of calcium spots. Best bet for cleaning hard water stains from your appliances is to use white vinegar. It’s also good to clean your coffee maker with vinegar on occasion to completely rid it of odors and stains anyway. This is 100% stainless steel inside and out. So if you don’t want plastic-anything, the Frieling brand is a name to buy. Again, like the Chambord French Press maker above, this a smaller version that will make a 12 oz cup of coffee. While the single-portion French press coffee makers are a great idea for the infrequent coffee consumer, the smaller the coffee press, the easier it may break. Everything has to be on a smaller scale and that includes the thickness of the glass carafe as well. I’d be more inclined to go with the 17oz above. And it appears the next size up for a Bodum Chambord is 34oz. But this is non-the-less a great option for a small coffee press. I love the quality of Le Creuset’s cookware, so I’m super excited to see the Le Creuset Petit French Press. This adorable ceramic French press makes a tasty 12oz pot of coffee. 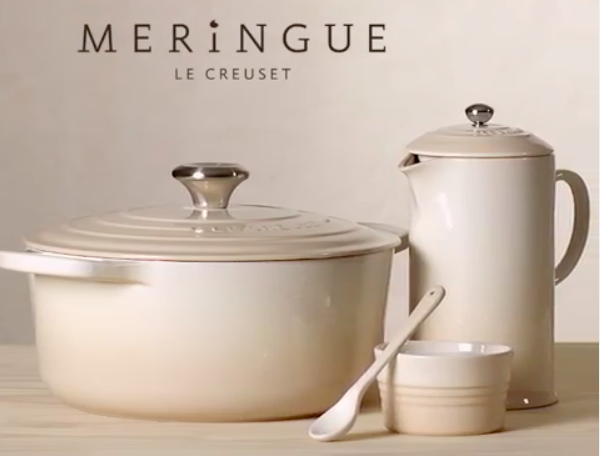 Le Creuset started producing cast iron, enameled pots in 1925 in Fresnoy le Grand, France. You might remember or even have a volcano orange French oven. Those things are heavy, but Le Creuset-anything is well worth the money. They now have a massive line of super quality cookware. Even if you find something at a garage sale, pick it up. You’ll thank me later. Their small French Press coffee makers are made with the same quality, albeit they are not cast iron. These are thick, quality stoneware that doesn’t crack or scratch easy. They maintain even heating and can be put in the oven, microwave and dishwasher. Don’t put the coffee plunger in the microwave because it has metal parts, but the stoneware carafe can go in the microwave. And I’ve read that the dishwasher isn’t kind to these presses either. Just hand wash it. They also make a Le Creuset French Press in 27oz which is great for 3 decent cups of coffee. And the best thing is that these enameled-gloss stoneware French presses come in 11 different colors. You can match it to your kitchen. This is a brilliant press coffee maker. 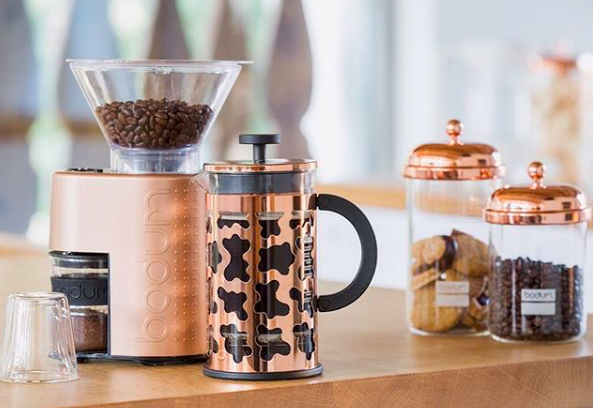 For a sweet little portable French press coffee on the go, again Bodum is the brand to go to. The Traveling Portable French Press is a perfect way to take your coffee on the road. It’s made of BPA-free, double-walled plastic and holds 15oz. You make your French press the same as the counter-top version, but you can drink directly out of the container. 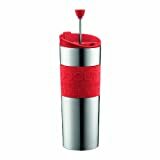 There is also a Bodum stainless steel portable French press travel mug instead of plastic, if you prefer. The stainless steel Bodum is vacuum sealed and will keep your beverages warm for hours. Two great portable French press options. Easy to take to the beach while you’re relaxing on the beach on the Mediterranean. They both have spill-resistant lids, built in coffee plunger, silicone hand grips, are dishwasher safe and come in 4 colors. Plus, I’m spoiled. I have a coffee roaster literally downstairs. Some days I can smell roasted coffee wafting up into my bedroom! I love to pop into Cafe Indiens, ask their advice on what’s new, and have them grind to my specific need. Some days I want an espresso grind because I love making coffee in my traditional Bialetti Moka coffee maker, other days it’s for the French Press coffee maker. 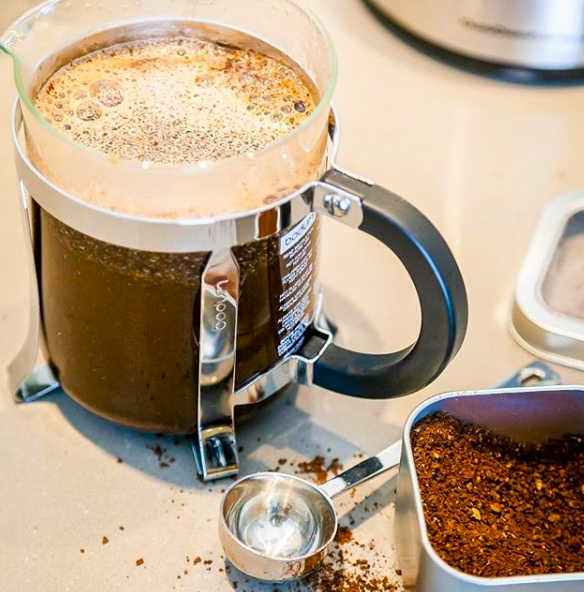 Lots of people swear by a ‘Burr’ grinder, particularly for French Press Coffee. It’s easier to explain what this grinder isn’t. It isn’t a blade grinder like the Krups Coffee Grinder from the 80’s, which you can’t even buy any more. I remember my friend Kitty having one of these new-fangled grinders in chic LA, and coming from Wisconsin, I thought she had it made with her own coffee grinder. You put the beans in the cup with that little propellor blade, put the lid on and then press down the button to start grinding. Well, things have changed. A Burr is not like that. A Burr has metal plates that grind against one another. 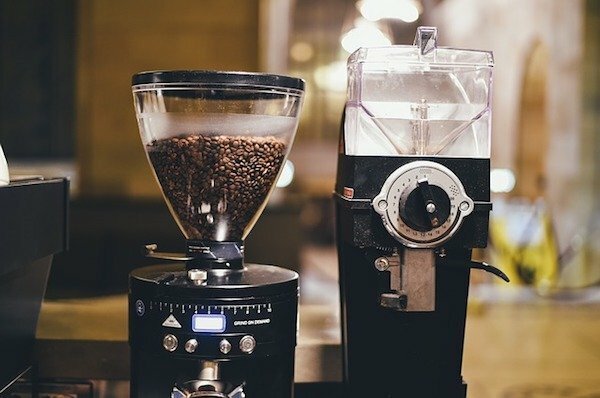 You can regulate the type of grind on these machines based on the type of coffee you are making. One small one I’d consider for my kitchen is the Brim Electric Handheld Coffee Grinder below. This great little grinder has 9 settings to grind a proper espresso up to the coarse grind for a French Press. It’s an all-in-one grinder that has one-such operation. The container holds 1/4 cup of coffee, so 4 Tbsp or enough for 4 cups of coffee. The electric cord detaches and it’s not a bad piece to have on the countertop. It’s a real space saver and a quiet coffee grinder to buy. The thing I love about this handheld grinder is that you don’t have to keep different grinds of coffee in various bags or containers. 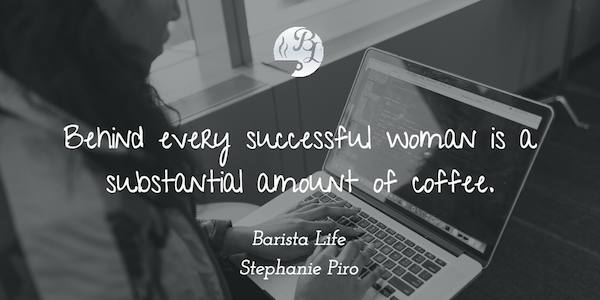 You grind for that specific pot of coffee you are making. If you want an espresso grind, you grind on the smaller of the two settings. You want a grind for French Press, you use the higher buttons. Then you just store your coffee beans waiting for the next fresh grind.